Mellow Mushroom’s vegan pizza makes me happy! Just showing off some of the awesome pizza we ate last night. I wasn’t in the mood to cook and decided we should go to MM, even though we have no business going out to eat right now. We’re broke and trying to move out of state. Oh well. It was SO GOOD. 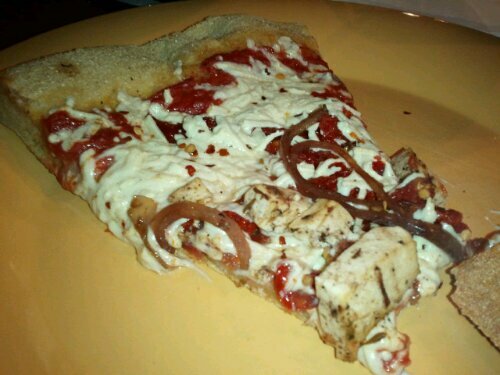 This pizza was a tomato sauce base w/ Daiya cheese, caramelized onions, sun dried tomatoes & jerk tofu. Mmm! Too bad there aren’t any Mellow Mushrooms in Seattle! In the meantime, we have to take advantage of the deliciousness. What?! Shoulda called me! I love Mellow…same with the beer but they do have 241 on tuesday night. DM me your # on FB or twitter and I’ll text you next time! Awesome! I went MM in Denver last summer. So good! I had BBQ sauce w BBQ chik’n pizza. I wish there were MM’s around here! wait, did they have Gardein? at mine they have they have tempeh or several seasoned tofu choices. That sounds amazing! I can’t wait to check them out.